Background Therapeutic targets have been defined for diseases like diabetes, hypertension or rheumatoid arthritis and adhering to them has improved outcomes. Such targets are just emerging for spondyloarthritis (SpA). 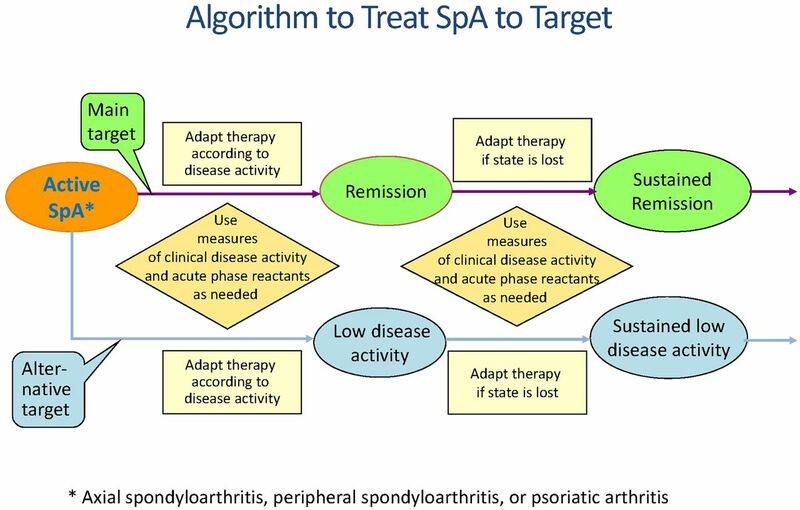 Objective To define the treatment target for SpA including ankylosing spondylitis and psoriatic arthritis (PsA) and develop recommendations for achieving the target, including a treat-to-target management strategy. Methods Based on results of a systematic literature review and expert opinion, a task force of expert physicians and patients developed recommendations which were broadly discussed and voted upon in a Delphi-like process. Level of evidence, grade and strength of the recommendations were derived by respective means. The commonalities between axial SpA, peripheral SpA and PsA were discussed in detail. Results Although the literature review did not reveal trials comparing a treat-to-target approach with another or no strategy, it provided indirect evidence regarding an optimised approach to therapy that facilitated the development of recommendations. The group agreed on 5 overarching principles and 11 recommendations; 9 of these recommendations related commonly to the whole spectrum of SpA and PsA, and only 2 were designed separately for axial SpA, peripheral SpA and PsA. The main treatment target, which should be based on a shared decision with the patient, was defined as remission, with the alternative target of low disease activity. Follow-up examinations at regular intervals that depend on the patient's status should safeguard the evolution of disease activity towards the targeted goal. Additional recommendations relate to extra-articular and extramusculoskeletal aspects and other important factors, such as comorbidity. While the level of evidence was generally quite low, the mean strength of recommendation was 9–10 (10: maximum agreement) for all recommendations. A research agenda was formulated. Conclusions The task force defined the treatment target as remission or, alternatively, low disease activity, being aware that the evidence base is not strong and needs to be expanded by future research. These recommendations can inform the various stakeholders about expert opinion that aims for reaching optimal outcomes of SpA. Despite all these advances, a variety of challenges exist when considering the management of patients with SpA,21–24 not least because the definition of a clear therapeutic target and strategies to reach such target are not yet optimally defined. In many areas of medicine, such as diabetes care or cardiology, clear therapeutic targets are available.25–30 More recently, a treatment target has also been advocated for rheumatoid arthritis (RA), namely remission or low disease activity,31 ,32 a recommendation based on insights from various clinical trials as revealed by systematic literature reviews (SLRs).33 ,34 Much less information on the value of defining therapeutic targets is currently available for AS or PsA. Therefore, a task force was formed to discuss and develop a consensus on recommendations aimed at defining a treatment target for, and thus at improving the management of axial and peripheral SpA in clinical practice. The consensus finding consisted of a three-step process. In a first step, the first and last author invited leading experts, defined on the basis of their citation frequency in the field and previous contributions to similar activities to form a steering committee. This steering committee, which included rheumatologists experienced in the care of patients with, and/or clinical research in axial and/or peripheral SpA (several of them Department chairs and thus in managerial functions), a dermatologist experienced in psoriasis, and patients being diagnosed with one of these diseases and/or experienced in consensus finding processes, met in March 2011 in Vienna to discuss unmet needs in the therapeutic management of and the potential of using treatment targets in AS and PsA. To this end, the debate focused on axial and peripheral SpA separately in two breakout groups with a subsequent common assessment. In the course of these discussions there was unanimous agreement that defining therapeutic targets and an appropriate strategic treatment approach would be valuable, but that evidence for its validity may be lacking. Therefore it was decided to perform a SLR and respective PICO (Patient, Intervention, Control, Outcome) and search terms were formulated, in line with European League Against Rheumatism (EULAR) and Appraisal of Guidelines for Research and Evaluation recommendations.35 ,36 In the course of defining the scope of this activity, the target populations were also specified, namely health professionals involved in care of and patients affected by axial and/or peripheral SpA. In addition, social security officials, hospital managers and policy makers at national and international levels were considered potential stakeholders in this activity. At a subsequent meeting in November 2011 (Dusseldorf) comprising an expanded task force with increased international participation, the SLR was presented. These invitations were a consequence of the individuals’ contributions to the field and deliberations among members of the steering committee. The literature search had revealed that currently no strategic trials addressing a target-oriented, steered therapy were published, although some indirect evidence on optimal therapeutic approaches was available to inform the next stages of the process.37 A major focus of discussion at this meeting, but also already at the steering committee meeting, was the question if diseases like AS, PsA, ReA and IBD arthritis should be seen as an entity or as different diseases. The respective decision would have a bearing to the consensus finding process, since it would mean to develop one, two or more documents. The initial deliberations tended toward separating the individual diseases for several reasons: (1) despite many commonalities, some important clinical manifestations are distinct between these conditions and certain health professionals (such as dermatologists and gastroenterologists) may not be sufficiently aware of the more unifying concept of SpA or its relevance when dealing with these conditions; (2) further, the existing distinction between PsA and AS is well known for and accepted by patients and changes in terminology may cause confusion regarding the understanding of their ‘new’ diagnosis; (3) to date, clinical trials have been performed almost entirely in individual subentities (AS, PsA) rather than SpA, and even most recently trials in a highly specific novel subset, non-radiographic axSpA, have been performed38; (4) the current drug approval process by regulatory agencies is also related to the individual diseases rather than SpA; and (5) there is some overlap between the different subgroups, but there are also major distinctions, for example, PsA with symmetric polyarthritis as the predominant feature would not fit well into either the axial or peripheral SpA group. Therefore, the provisional choice was to develop at least two documents, one for axSpA and one for PsA. The discussions took place in separate breakout sessions devoted to these topics and in a plenary session. At the plenary session, certain items were reformulated and reordered and two provisional sets of recommendations developed, with decisions made using a modified Delphi technique.32 The group then realised how similar the individual statements in each of the two documents were, but left further decisions to the next stage of the process. With these two documents prepared and having in mind that peripheral SpA (such as ReA) had not yet been dealt with in detail, an even larger committee met in April 2012 (Amsterdam); its membership comprised the initial task force expanded by consideration of a more international scope to also include experts from Latin America and Asia, aside from previous participants from Europe and North America. Again, the scope and background of this activity was discussed and the provisional recommendations presented. The issue of disease definition and the need of developing one, two or three documents were addressed. The committee separated into three breakout groups discussing axSpA, peripheral SpA and PsA. In the course of the breakout discussions and the plenary session, the initial recommendations were amended and then votes cast. Importantly, when looking at the individual items, the participants felt that most of them were very similar and a broad decision was then taken to develop a single document comprising overarching principles and items common to SpA in general, but within that common document to develop a few individualised items for axSpA, PsA and peripheral SpA. Each statement, which had been formulated as a draft for voting in the course of the breakout sessions and by the whole task force, was subjected to voting as ‘yes’ (agreement with the wording) or ‘no’ (disagreement). Statements supported by ≥75% of votes were immediately accepted while those with ≤25% were rejected outright. Others were subjected to further discussion and subsequent voting, where ≥67% support or, in an eventual third round, a majority of ≥50% was needed. After the face-to-face meeting, the statements were distributed to the committee members by email for final comments. Only suggestions for improvements of clarity of wording or addressing redundancies were considered, while any changes to the meaning were not accepted. Finally, the group voted anonymously by email on the level of agreement, that is, strength of recommendation, with each of the derived bullet points (in the form it was ultimately agreed upon by the qualified majority of participants) using a 10-point numerical rating scale (1=do not agree at all, 10=agree completely). The SLR, which is published separately,37 revealed that in contrast to findings in RA33 no randomised controlled clinical trial has evaluated a targeted therapeutic approach in comparison with routine therapy. However, several publications had employed therapeutic targets and respective time requirements as endpoints or before escalating therapy, although this is often the placebo arm of a study that was allowed to escape or then escalated to active treatment. These comprised 14 studies in AS and 7 studies of PsA which were found suitable to inform the task force. Nevertheless, given the lack of studies evaluating target-steered versus non-steered treatment, the level of evidence for the developed recommendations is low and mainly based on expert consensus. The individual statements receiving a positive vote by the majority of the expert committee members comprise 5 overarching principles and 11 recommendations. The overarching principles and 9 of the statements are recommended for SpA in general, whereas the last 2 statements have been individualised for axSpA, peripheral SpA and PsA. The recommendations are shown in table 1. They are discussed in detail below and this detailed description should be regarded as part and parcel of the recommendations. In the Committee's view, a number of elements related to treating SpA are so representative of good clinical practice that they form a general framework for more specific recommendations. These were therefore termed overarching principles, and five such principles were developed and voted on. A. The treatment target must be based on a shared decision between patient and rheumatologist. Patient involvement in therapeutic decision-making has become a mandate in patient care, especially when dealing with chronic diseases. This is a general patient right, and has been shown to improve mutual understanding and outcome39–42 and is also increasingly recognised to be important in SpA.43–45 The committee was convinced that patients must be informed about the proposed treatment target, therapeutic options to reach the target and reasons for recommending the target also in light of the risk related to treatment and risk related to the disease; on the other hand, patients should actively participate in this discussion. This aspect is subsequently reinforced in recommendation number 8 and these two items received the highest level of agreement among all bullet points. The principle also specifically mentions the rheumatologist, since it is the rheumatologist who should coordinate treatment of patients with SpA. Evidence regarding RA suggests that patient outcome is better when care is provided by a rheumatologist,46 and this might also be so for the musculoskeletal manifestations of PsA and SpA. B. SpA and PsA are often complex systemic diseases; as needed, the management of musculoskeletal and extra-articular manifestations should be coordinated between the rheumatologist and other specialists (such as dermatologist, gastroenterologist, ophthalmologist). This item is supposed to inform patients, healthcare professionals with less experience in the care of SpA and non-medical stakeholders that patients with SpA are frequently suffering from extramusculoskeletal manifestations and are often in need of multidisciplinary care for optimal therapy. When multiorgan involvement is present, a harmonised approach among specialists is required which should ideally be coordinated by the rheumatologist, especially if the musculoskeletal involvement causes major complaints. C. The primary goal of treating the patient with SpA and/or PsA is to maximise long-term health related quality of life and social participation through control of signs and symptoms, prevention of structural damage, normalisation or preservation of function, avoidance of toxicities and minimisation of comorbidities. The significant burden of axSpA and PsA in terms of disability, loss of quality of life and work productivity has only recently been appreciated.47–52 This generally formulated item addresses the importance to control signs and symptoms like pain, structural changes such as ankylosis,53 ,54 comborbidities55–57 and the importance of focusing on the totality of disease manifestations and complications when determining the proposal for a treatment target. D. Abrogation of inflammation is presumably important to achieve these goals. PsA and SpA are inflammatory diseases and inflammation leads to their signs and symptoms, functional impairment as well as structural changes.7 ,11 ,58–61 Therefore, stopping inflammation appears to be of key importance to optimise outcome. Indeed, in many patients non-steroidal anti-inflammatory drugs (NSAIDs) can lead to cessation of signs and symptoms, normalisation of physical function and potentially inhibition of structural damage in the spine.62 ,63 Interference with the proinflammatory cytokine tumour necrosis factor (TNF) suppresses inflammation effectively and can lead to disappearance of signs and symptoms and maximal improvement of physical function. Thus, the task force was convinced that disappearance of inflammation conveys the best outcome. However, current evidence indicates that TNF inhibition does not prevent progression of structural changes in AS.64 ,65 Moreover, it has not been determined if a state of remission leads to better long-term outcome of SpA and/or PsA than low disease activity. Thus, this item is somewhat more controversial than most other ones. Therefore the word ‘presumably’ was added. This point constitutes a backbone for some of the subsequent individual recommendations. E. Treatment to target by measuring disease activity and adjusting therapy accordingly contributes to the optimisation of short and/or long-term outcomes. The SLR has revealed that patients with AS who do not reach predefined, measurable treatment targets can achieve further improvement upon adaptation of their therapy. While for PsA this has not yet been established, the task force regarded the need to measure disease activity and amend therapy with persistently active disease as a general necessity and, therefore, as a principle. The level of agreement with these five principles was very high, ranging between 9.1 (item D) and 9.7 (item A) on a scale of 10 (table), indicating that this large and quite heterogeneous task force had arrived at a quite unanimous view on the principal importance of certain approaches to treatment of SpA. As mentioned previously, after intensive deliberations the committee had decided to create just one document covering axial and peripheral SpA, including PsA. To this end, nine unified recommendations and two additional items dealing separately with PsA, axial SpA and peripheral SpA were developed in the course of the discussions. These recommendations applied the results of the SLR, but given the low available evidence in the literature, they were mostly based on expert opinion, albeit consensual opinions of a large group of experts. The sequence of the recommendations follows a logical order, but also reflects the level of importance considered by the committee for each individual bullet point. 1. A major treatment target should be clinical remission/inactive disease of musculoskeletal involvement (arthritis, dactylitis, enthesitis, axial disease), taking extra-articular manifestations into consideration (level of evidence (LoE): 5, grade of recommendation (GoR): D). Hitherto, no clinical trial has compared outcomes of PsA or axSpA for progression of structural changes or improvement of physical function or quality of life when remission rather than another state was targeted. Definitions for remission (which is called inactive disease in AS) or at least minimal disease activity (MDA) exist for PsA and AS,12 ,66 ,67 but in contrast to RA the long-term benefits of remission have not yet been sufficiently established. Also, no clear definition of remission for extra-articular musculoskeletal features, such as enthesitis or dactylitis, is currently available. Moreover, it is not sufficiently known at present how remission of musculoskeletal symptoms relates to remission of skin disease in PsA or bowel disease in IBD. Therefore, the formulation of this first bullet point reflects the general lack of data, by saying ‘a major’ rather than ‘the major’ treatment goal, or by expanding the term ‘clinical remission’ to the somewhat less stringent term ‘inactive disease’. However, the lack of thorough evidence and the unwillingness of the group to arrive at a more determined and clear verbalisation of this bullet point must not be mistaken as an uncertainty of the task force regarding the necessity of treating patients to become free of signs and symptoms of their peripheral joint or axial disease. On the contrary, the task force deemed this approach to be of utmost importance for short-term benefit and long-term outcome. Therefore it was placed as the first recommendation. Importantly, the group focussed the terms ‘remission’/‘inactive disease’ to the musculoskeletal manifestations of SpA and not the extramusculoskeletal abnormalities, although it clearly stated in the last part of this item that this must not be neglected in the therapeutic decision making. After several rounds of discussion, 83% of the participants agreed with the formulation of this bullet point and the strength of recommendation amounted to 9.5±0.9. This item emphasises that every patient should be treated according to her or his current clinical manifestations and that in light of their heterogeneity each of these manifestations has to be accounted for when setting the therapeutic target. However, it also implies that at certain points in time the musculoskeletal symptoms may not be in the foreground, such as when extra-articular manifestations prevail and need appropriate attention. Again, no data exist in the literature to support or refute this recommendation which was voted for by 87% of the participants and attained a strength of recommendation (SoR) of 9.3±1.0. 3. Clinical remission/inactive disease is defined as the absence of clinical and laboratory evidence of significant inflammatory disease activity. This bullet point provides a definition for item 1 in order to clarify the definition of remission. Remission of an inflammatory rheumatic disease ideally comprises the absence of its signs and symptoms, the maximal improvement in physical function and halt of structural changes. While there is compelling evidence that these three characteristics go along with each other in RA, this is not yet sufficiently known in AS and PsA. However, in PsA, progression of joint damage is correlated with swollen joint counts and dactylitis59 ,68 and, therefore, it may be assumed that clinical remission will also lead to halt of structural progression. This is not quite clear in AS, since progression of syndesmophyte formation has been observed even when patients were in clinical remission on TNF inhibitors and formation of syndesmophytes occurred without presence of MRI inflammation.8 ,64 ,65 ,69 On the other hand, elevated levels of acute phase reactants (APRs) are associated with progression of structural changes in AS.70 Further, physical function and quality of life are related to symptoms of these diseases.71 For all these reasons the task force defined remission as stated above. Definitions of remission or partial remission are available for AS, when using mere patient reported outcomes67 or the more recently described Ankylosing Spondylitis Disease Activity Score (ASDAS).12 For PsA, remission criteria are not well established,66 especially given that in PsA most composite measures have been borrowed from RA while a composite measure specific for PsA has only recently been validated,10 but criteria for disease activity states have not yet been defined. Importantly, the term ‘significant’ was added deliberately, indicating that the presence of a minute extent of residual activity, such as the presence of a tender joint or residual swollen but painless joint, or residual axial pain that does not appear to relate to inflammation, would still be compatible with remission. On the other hand, the committee wished to have a stringent definition of remission which would not allow significant residual disease activity, such as several swollen joints or significant back pain, even if dramatically improved by therapy, to be called remission. Also, this bullet point speaks of ‘clinical remission’ indicating that clinical rather than imaging measures should be used to define remission, at least currently. In this respect it should be noted that MRI shows evidence of inflammation in AS and that a negative MRI can be regarded as imaging remission; however, the relationship between clinical and imaging remission still needs to be elaborated. Statement 3, which like the previous ones is based on expert opinion, received approval by 83% of the committee members and a SoR of 9.0±1.4. While remission (inactive disease) constitutes an ideal goal, clinical practice, stringently as it was defined in bullet point number 3 it may be difficult to achieve in many patients, especially those with established/long-standing disease. Indeed, patients with axSpA with longer disease duration are less likely to attain partial remission than those with early disease.72 ,38 Thus, while remission is the ultimate and an ideal goal, low disease activity constitutes a useful alternative in the opinion of the task force, since it is assumed that physical function and quality of life may not be much worse than in remission and progression of structural damage, while possibly not halted, would be minimal. Indeed, as included in the bullet point, low disease activity can also be regarded as ‘MDA’. Thus, minor residual signs and symptoms may still exist differentiating this state from inactive disease. Importantly, by stating that low disease activity is an alternative goal to remission, the committee also clearly implies that any other, higher state, even moderate disease activity, would not be acceptable and its presence should elicit therapeutic adaptations. More research will be needed to provide information on the optimal time point for achieving the treatment target. However, given that in clinical trials of AS maximal improvement was achieved between week 12 and week 24 regarding all outcome measures including ASAS partial remission4 ,73 ,74 and that similar observations have been made in PsA,2 ,75 ,76 a maximum of 6 months for reaching the treatment target of low disease activity or remission seems appropriate, but it is advisable to adapt therapy earlier if no significant reduction in disease activity is observed within 3 months. Recently, thresholds for disease activity states including inactive disease (equivalent to remission) have been defined for axSpA using the ASDAS,12 and ASAS definition of partial remission is also available67; a measure of MDA has been developed for PsA which is beginning to be used in clinical trials.77 ,78 Additional research in this respect will be required, especially for PsA and peripheral SpA. This item was accepted as defined by 79% of the participants and received a SoR of 9.4±0.9. 5. Disease activity should be measured on the basis of clinical signs and symptoms, and APRs (LoE: 5, GoR: D). Traditionally, given that the spine is not as accessible to physical examination of signs of inflammation like a peripheral joint, disease activity in axSpA has been evaluated by employing the Bath Ankylosing Spondylitis Disease Activity Index (BASDAI) which comprises only patient reported variables related to symptoms of the disease. However, axSpA is an inflammatory disease with involvement of various inflammatory cells and cytokines.79 ,80 Indeed, inhibition of TNF is one of the mainstays of treatment today, leading to relief of symptoms, and inhibition of prostaglandin synthesis can reduce clinical symptoms, and retard progression of structural changes62 ,63; this appears to be particularly prominent in patients with elevated APRs, and the latter seem to be associated with progression of syndesmophyte formation.70 ,81 ,82 Consequently, disease activity assessment during follow-up and in the course of targeting a good outcome should comprise the assessment of clinical aspects of the disease as well as laboratory abnormalities, that is, APR measurement. This can be done separately by looking at for example, BASDAI and c-reactive protein (CRP), or by using a measure that comprises both aspects, such as ASDAS.11 Along the same line, PsA as an inflammatory and potentially destructive joint disease should be followed using measures that relate to the joints and the serological inflammatory response; these are contained in RA-related composite measures of disease activity, such as Disease Activity Score (DAS), DAS28 and Simplified Disease Activity Index (SDAI), but also in the Disease Activity in PsA and the psoriatic arthritis disease activity score.13 The current recommendation does not relate to systemic features of SpA, but solely to the musculoskeletal manifestations. For systemic features, other measures are needed and, according to the EULAR recommendations for treatment of PsA,18 this should be done in collaboration with respective specialists. Recommendation 5 received approval by 97% of participants and the SoR amounted to 9.4±1.1. Patients with chronic musculoskeletal diseases are frequently also suffering from comorbidities that (1) may be related to the overall spectrum of the disorder (such as IBD, uveitis or psoriasis), (2) may occur as a consequence of chronic inflammation (such as cardiovascular disease), (3) may be related to therapy (such as gastric ulcer or infection), or (4) just may occur concomitantly by chance. The presence of such comorbidities may alter the level of the treatment target, since the risk of aggravating the comorbid condition may outweigh the benefit conveyed by more intensive therapy to achieve the treatment target of the musculoskeletal manifestations. Further, the choice of follow-up measure may have to be changed under certain circumstances. For example, a concomitant disease which raises pain levels or APRs may influence the result of measuring disease activity. Likewise, when following patients on therapies that affect the APRs independently of clinical benefit one may have to reconsider the choice of a measure that contains an APR. Therefore, this point focuses on the application (and sometimes restricted applicability) of particular disease activity measures. This recommendation was approved by 97% of the task force members and received a SoR of 9.4±1.0. It is clear that no patient's successfully targeted disease activity state should deteriorate during follow-up, since reactivation of disease may again lead to reduced quality of life and disability. There is evidence that on demand NSAID therapy, in contrast to regular NSAID treatment, is associated with progression of radiographic changes in AS63 and that stopping TNF-blocker therapy will lead to reactivation of AS83 and PsA.84 While the present consensus statement is not designed to provide recommendations on therapies with particular agents but rather on treatment strategies, the task force nevertheless points to the importance of maintaining the targeted therapeutic state once achieved and advises against stopping a successful therapy based on the available evidence. However, it has not yet been studied sufficiently if dose reduction or expansion of treatment intervals allows maintaining a good clinical state. Approval was given by 90% of the task force's members and the SoR amounted to 9.4±0.8. While this statement has already been partly covered in the overarching principles, it was felt important to also raise this point in the context of the actual recommendations to bolster the importance of interaction between health professionals and their patients in all regards: setting and agreeing on the treatment target, discussing the strategies available to reach that target and the time it may take to attain it, and laying out the benefits and risks of the recommended treatment and consider the totality of clinical disease manifestations (including the extramusculoskeletal ones) and of comorbidities. This point also comprises the need to discuss steps to be taken if the treatment target is not achieved, such as adjustment of or switch to a new therapy. In this respect patient education programmes or booklets may provide additional helpful means. This item was approved by 81% of the participants and the SoR was 9.8±0.5. 9. Structural changes, functional impairment, extra-articular manifestations, comorbidities and treatment risks should be considered when making clinical decisions, in addition to assessing measures of disease activity. This point is focused on considerations involved in therapeutic decision making. Although the last part of this recommendation emphasises the importance of regular assessment of disease activity with appropriate measures (see items 5 and 6), the first part suggests taking into account results of other investigations for treatment decisions, such as by imaging (especially structural changes in PsA), physical function and extra-articular manifestations. The latter comprise enthesitis or dactylitis as well as extramusculoskeletal disease. This is of importance, since treatment approaches to PsA will differ in the presence of enthesitis compared with patients who do not suffer from entheseal affection.18 Moreover, organ disease, such as lung involvement, aortitis, intestinal or skin manifestations as well as uveitis, may require involvement of other specialists (see overarching principle B). In particular uveitis can present across the spectrum of SpA and may reflect disease activity, and inflammatory bowel disease and psoriatic skin involvement must be considered in the respective disorders and do not strongly correlate with the degree or extent of musculoskeletal involvement. Risks and comorbidities are also reiterated here in the context of treatment decisions; before they were indicated with respect to the choice of measures of disease activity (see recommendation 6) and in relation to patient information (item 8). This recommendation achieved 100% agreement and a SoR of 9.5±0.8. As indicated above, items 10 and 11 have been formulated specifically for axSpA, PsA and peripheral SpA to account for the differences between certain characteristics of the different spondyloarthritides. 10. Validated composite measures of disease activity such as BASDAI plus APRs or ASDAS, with or without measures of function such as Bath Ankylosing Spondylitis Functional Index (BASFI), should be performed and documented regularly in routine clinical practice to guide treatment decisions; the frequency of the measurements depends on the level of disease activity. This item is an expansion of recommendation numbers 5 and 9. It mentions those disease activity measures which have been repeatedly validated and are already in use in contemporary clinical trials. In line with recommendation 5, when BASDAI is employed, an APR, such as CRP or erythrocyte sedimentation rate, should also be determined. The ASDAS already comprises such a measure among its components.12 In addition, this recommendation also suggests the use of a particular functional measure, but other validated measures can also be applied (therefore the tem ‘such as’). With highly active disease, follow-up examinations will have to be more frequent than with inactive disease/remission. Moreover, the recommendation requests documentation of the measured results. Among task force members, 88% approved this item and SoR amounted to 9.3±1.0. 11. Other factors such as axial inflammation on MRI, radiographic progression, peripheral musculoskeletal and extra-articular manifestations, may also be considered when setting clinical targets. Again, this recommendation expands item 9, but specifically mentions MRI as a highly valuable imaging method for the potential follow-up of axSpA. Likewise, non-axial disease manifestations will influence not only the therapeutic approach but have to be considered when setting treatment targets. Approval was voted for by 88% of the members and the SoR was 9.3±0.8. 10. Quantified measures of disease activity, which reflect the individual peripheral musculoskeletal manifestations (arthritis, dactylitis, enthesitis) should be performed and documented regularly in routine clinical practice to guide treatment decisions; the frequency of the measurements depends on the level of disease activity. This recommendation, while expanding items 5, is here specifically tailored to peripheral SpA, such as ReA, IBD arthritis or former ‘undifferentiated’ peripheral SpA. Measures of disease activity are available and have been validated for the arthritis component of ReA9 and there exist measures for dactylitis and enthesitis which have not been primarily developed for peripheral SpA, but rather for PsA or AS.85–87 While they will have to be validated in peripheral SpA, they can be assumed useful for clinical practice until proven otherwise. Also this recommendation calls for documentation of the measured results. Of the participants, 100% approved this item and the SoR score achieved was 9.3±0.9. 11. Other factors such as spinal and extra-articular manifestations, imaging results, changes in function/quality of life, as well as comorbidities may also be considered for decision. This item reiterates and expands recommendation 9 and achieved 100% approval; the SoR was 9.4+0.8. 10. Validated measures of musculoskeletal disease activity (arthritis, dactylitis, enthesitis, axial disease) should be performed and documented regularly in routine clinical practice to guide treatment decisions; the frequency of the measurements depends on the level of disease activity; cutaneous manifestations should also be considered. Specific mention of skin disease tailors this recommendation to PsA, although skin may also be involved in axial and peripheral SpA. Further, in addition to arthritis, dactylitis and enthesitis, axial disease assessment is specifically brought forward here. Finally, a reminder is provided that the results of the various measures (and also the treatment target) should be documented. Clearly, with highly active disease patients should be seen frequently, such as monthly to every 3 months, while with low disease activity or remission, follow-up examinations may be done only every 6–12 months. However, skin involvement also has to be taken into account. The voting achieved 92% approval and the SoR amounted to 9.4±0.8. 11. Other factors such as spinal and extra-articular manifestations, imaging results changes in function/quality of life, as well as comorbidities may also be considered for decision. As for the other disease entities, this last recommendation expands item 9 and also the preceding one by reiterating the importance of comorbidities, and axial and soft tissue manifestations of PsA in the course of making treatment decisions. Approval was granted by 100% of the participants and the SoR amounted to 9.3±1.0. A final anonymous vote on whether the task force members felt influenced by the fact that support for this activity was provided by a company, the result was 0.4±1.3 (0 meaning no and 10 meaning heavy influence), indicating that the participants felt negligibly influenced. Since none of the recommendations is based on evidence, the research agenda has to comprise the search for evidence for all of them. However, beyond mere therapeutic aspects, insights into the relationships between individual musculoskeletal manifestations, damage and disability are still incomplete especially for the peripheral SpA, including PsA. Table 2 lists a research agenda as mentioned during the task force's meetings. Recommendations to treat axSpA and PsA have been developed over the recent years.17–19 However, none of these addressed a clear therapeutic target and a strategy to reach this target. This has now been done in the present set of recommendations, and additional strategic aspects of treatment approaches are presented. Thus, the present consensus on treatment targets and general treatment approaches complements the published management recommendations,17–20 but a notable difference is the absence of suggestions or recommendations regarding a particular drug in any of the overarching principles or individual recommendations. Treatment recommendations should usually be based on evidence. However, where evidence is missing, expert opinion has to come into play. The recommendations presented here are not based on hard evidence, because strategic therapeutic trials, in which therapy was consistently adapted to reach a prespecified treatment target and compared with a non-steered approach, as performed in RA,88 ,89 are currently not available for axSpA, peripheral SpA or PsA, and other pertinent literature is scarce. While a SLR has provided indirect evidence from clinical trials which targeted specific endpoints37 and thus supplied some information towards the work of the task force, the individual recommendations can only be regarded as expert opinion (consensus) and therefore call for more research in the field. So why then were the recommendations developed now rather than waiting for more evidence? Because the definition of a treatment target and strategy is timely at present in light of two major aspects: (1) a field like that of SpA should not stay behind other disease areas which have already defined their targets years to decades ago, when at least indirect evidence for the benefit of attaining certain treatment targets is available; and (2) the tremendous therapeutic advances of the past decade have greatly improved the chances of achieving good outcomes and, therefore, setting stringent treatment milestones has become a reality which should not be concealed. Moreover, in the course of its initial discussions on this issue, the task force felt that with these advances and the concomitant formulation of a research agenda, investigations towards providing respective evidence could be fostered and accelerated. Importantly, this view was shared among all task force members, which comprised patients and an international group of physicians with expertise in SpA. At all three steps of this activity, which included initial discussions by the steering committee, formulation of recommendations by an expanded working group and development of treatment recommendations for all three entities, axSpA, peripheral SpA and PsA, unanimous agreement was attained. Moreover, all items achieved strong consensus in an anonymous voting process, with the lowest result being a mean of 9.0 on a scale of 0–10, indicating that the task force stood quite united behind the recommendations. Several of the recommendations stand out in their importance, while others can be seen as supportive or operational. A call for remission or inactive disease became item 1, because this was regarded the foremost treatment target. Indeed, we can anticipate that reducing inflammation and disease activity to the minimum is optimal for the patients, at least for their quality of life. However, the members were aware that remission may not be achievable in all patients and, therefore, formulated an alternative treatment target, especially for patients with long-standing disease, namely low disease activity (recommendation 4). Importantly, this acknowledgement indicates that disease activity states other than remission or low disease activity constitute unacceptable clinical states, unless justified because of other reasons, such as comorbidity (items 6, 9 and 11). Importantly, while validated measures of disease activity are available for PsA and ReA, disease activity states have not yet been sufficiently defined, contrasting the situation in AS. Another complexity relates to the necessity to use measures that reflect the individual manifestations of a patient which in some instances may involve assessment of peripheral joint disease, axial involvement, dactylitis and enthesitis. To identify an individual treatment goal can in itself be seen as an important part of a treatment strategy when an intervention is initiated and should be accompanied by a monitoring programme. It is also important that the agreed goal is documented in the records of the patient. Patient involvement in defining the treatment target and selection of therapies based on their risks and benefits was deemed so important, that it is stated in the first overarching principle and additionally in one of the recommendations. As indicated above, given the small evidence base, the research agenda is of utmost importance. Research activities should focus on strategic therapeutic trials, and on addressing missing information, such as the definition of disease activity states in PsA. The recommendations are summarised in a simplified form in an algorithm presented in figure 1. Like most types of recommendations, it will be necessary to revise the current document in due course, presumably in about 4 years or 5 years or earlier, when significant evidence accumulates regarding the individual points of the recommendations. The task force hopes for an expansion of high quality research activities that either allow confirmation or modifications of its conclusions.
. Efficacy and safety of leflunomide in the treatment of psoriatic arthritis and psoriasis: a multinational, double-blind, randomized, placebo-controlled clinical trial. Arthritis Rheum 2004;50:1939–50.
. Update on treatment of psoriatic arthritis. Bull NYU Hosp Jt Dis 2012;70:167–71.
. Developments in therapies for spondyloarthritis. Nat Rev Rheumatol 2012;8:280–7.
. Relationship between active inflammatory lesions in the spine and sacroiliac joints and new development of chronic lesions on whole-body MRI in early axial spondyloarthritis: results of the ESTHER trial at week 48. Ann Rheum Dis 2011;70:1257–63.
. Development of a disease activity index for the assessment of reactive arthritis (DAREA). Rheumatology 2000;39:148–55.
. Application of the DAREA/DAPSA score for assessment of disease activity in psoriatic arthritis. Ann Rheum Dis 2010;69:1441–7.
. The development of candidate composite disease activity and responder indices for psoriatic arthritis (GRACE project). Ann Rheum Dis 2013;72:98691.
. Measures of psoriatic arthritis: tender and swollen joint assessment, Psoriasis Area and Severity Index (PASI), Nail Psoriasis Severity Index (NAPSI), Modified Nail Psoriasis Severity Index (mNAPSI), Mander/Newcastle Enthesitis Index (MEI), Leeds Enthesitis Index (LEI), Spondyloarthritis Research Consortium of Canada (SPARCC), Maastricht Ankylosing Spondylitis Enthesis Score (MASES), Leeds Dactylitis Index (LDI), Patient Global for Psoriatic Arthritis, Dermatology Life Quality Index (DLQI), Psoriatic Arthritis Quality of Life (PsAQOL), Functional Assessment of Chronic Illness Therapy-Fatigue (FACIT-F), Psoriatic Arthritis Response Criteria (PsARC), Psoriatic Arthritis Joint Activity Index (PsAJAI), Disease Activity in Psoriatic Arthritis (DAPSA), and Composite Psoriatic Disease Activity Index (CPDAI). Arthritis Care Res (Hoboken) 2011;63(Suppl 11):S64–85.
. The Assessment of SpondyloArthritis International Society classification criteria for peripheral spondyloarthritis and for spondyloarthritis in general. Ann Rheum Dis 2011;70:25–31.
. First update of the current evidence for the management of ankylosing spondylitis with non-pharmacological treatment and non-biologic drugs: a systematic literature review for the ASAS/EULAR management recommendations in ankylosing spondylitis. Rheumatology (Oxford) 2012;51:1388–96.
. Ankylosing spondylitis: a dual perspective of current issues and challenges. J Rheumatol Suppl 2006;78:1–3.
. Challenges comparing functional limitations in rheumatoid arthritis and ankylosing spondylitis. Clin Exp Rheumatol 2009;27(4 Suppl 55):S83–91.
. Current controversies in spondyloarthritis: SPARTAN. J Rheumatol 2010;37:2617–23.
. Therapeutic considerations in spondyloarthritis patients who fail tumour necrosis factor antagonists. Best Pract Res Clin Rheumatol 2010;24:683–92.
. Glycosylated hemoglobin and the risk of retinopathy in insulin-dependent diabetes mellitus. N Engl J Med 1995;332:1305–6. Veterans Administration Cooperative Study Group on Antihypertensive Agents. Effects of treatment on morbidity in hypertension. II. Results in patients with diastolic blood pressure averaging 90 through 114 mm Hg. JAMA 1970;213:1143–52. The Diabetes Control and Complications Trial Research Group. The effect of intensive treatment of diabetes on the development and progression of long-term complications in insulin-dependent diabetes mellitus. N Engl J Med 1993;329:977–86.
. Urgent care and tight control of rheumatoid arthritis as in diabetes and hypertension: better treatments but a shortage of rheumatologists. Arthritis Rheum 2002;46:851–4.
. Treating rheumatoid arthritis to target: recommendations of an international task force. Ann Rheum Dis 2010;69: 631–7.
. Treating Rheumatoid Arthritis to Target: multinational recommendations assessment questionnaire. Ann Rheum Dis 2011;70:1999–2002.
. Treating axial and peripheral spondyloarthritis, including psoriatic arthritis, to target: Results of a systematic literature search to support a consensus statement. Ann Rheum Dis 2013;73:238–42.
. Efficacy and safety of adalimumab in patients with non-radiographic axial spondyloarthritis: results of a randomised placebo-controlled trial (ABILITY-1). Ann Rheum Dis 2013;72:81522.
. Patient-doctor communication. Med Clin North Am 2003;87:1115–45.
. Shared decision-making based on different features of risk in the context of diabetes mellitus and rheumatoid arthritis. Ther Clin Risk Manag 2007;3:1175–80.
. BRIEF REPORT: patient-physician agreement as a predictor of outcomes in patients with back pain. J Gen Intern Med 2005;20:935–7.
. Comorbidities significantly impact patients’ preferences for psoriasis treatments. J Am Acad Dermatol 2012;67:363–72.
. Patient preferences for psoriasis treatments: process characteristics can outweigh outcome attributes. Arch Dermatol 2011;147:1285–94.
. What factors determine patients’ preference for tumour necrosis factor inhibitors in ankylosing spondylitis? Clin Rheumatol 2009;28:599–602.
. Matching physicians’ treatment recommendations to patients’ treatment preferences is associated with improvement in treatment satisfaction. J Eur Acad Dermatol Venereol 2013;27:76370.
. Differences in the use of second-line agents and prednisone for treatment of rheumatoid arthritis by rheumatologists and non-rheumatologists. J Rheumatol 1997;2:2283–90.
. Psoriatic arthritis: epidemiology, clinical features, course, and outcome. Ann Rheum Dis 2005;64(suppl 2):ii14–17.
. The burden of ankylosing spondylitis. J Rheumatol Suppl 2006;78:4–11.
. Impact of ankylosing spondylitis on work and family life: comparisons with the US population. Arthritis Rheum 2008;59:497–503.
. Effect of psoriatic arthritis according to the affected categories of the international classification of functioning, disability and health. J Rheumatol 2010;37:1885–91.
. Working status in patients with rheumatoid arthritis, ankylosing spondylitis and psoriatic arthritis: results from the British Society for Rheumatology Biologics Register. Rheumatology (Oxford) 2010;49:1570–7.
. Radiological outcome in ankylosing spondylitis: use of the Stoke Ankylosing Spondylitis Spine Score (SASSS). Br J Rheumatol 1996;35:373–6.
. Ankylosing spondylitis: the correlation between a new metrology score and radiology. Br J Rheumatol 1995;34:767–70.
. Cardiovascular and other comorbidities in patients with psoriatic arthritis: a comparison with patients with psoriasis. Arthritis Care Res (Hoboken) 2011;63:1729–35.
. Cardiovascular comorbidities in patients with psoriatic arthritis: a systematic review. Ann Rheum Dis 2013;72:2116.
. Comorbidity profiles among patients with ankylosing spondylitis: a nationwide population-based study. Ann Rheum Dis 2010;69:1165–8.
. Inflammation in an individual joint predicts damage to that joint in psoriatic arthritis. Ann Rheum Dis 2011;70:305–8.
. Predictors for radiological damage in psoriatic arthritis: results from a single centre. Ann Rheum Dis 2007;66:370–6.
. Rates and predictors of radiographic sacroiliitis progression over 2 years in patients with axial spondyloarthritis. Ann Rheum Dis 2011;70:1369–74.
. Outcome measures in psoriatic arthritis. J Rheumatol 2007;34:1159–66.
. Effect of non-steroidal anti-inflammatory drugs on radiographic spinal progression in patients with axial spondyloarthritis: results from the German Spondyloarthritis Inception Cohort. Ann Rheum Dis 2012;71:1616–22.
. Remission in psoriatic arthritis. J Rheumatol Suppl 2012;89:19–21.
. Dactylitis in psoriatic arthritis: a marker for disease severity? Ann Rheum Dis 2005;64:188–90.
. A stratified model for health outcomes in ankylosing spondylitis. Ann Rheum Dis 2011;70:1758–64.
. Effects of etanercept versus sulfasalazine in early axial spondyloarthritis on active inflammatory lesions as detected by whole-body MRI (ESTHER): a 48-week randomised controlled trial. Ann Rheum Dis 2011;70:590–96.
. Adalimumab for the treatment of patients with moderately to severely active psoriatic arthritis: results of a double-blind, randomized, placebo-controlled trial. Arthritis Rheum 2005;52:3279–89.
. Validation of minimal disease activity criteria for psoriatic arthritis using interventional trial data. Arthritis Care Res (Hoboken) 2010;62:965–9.
. Use of immunohistologic and in situ hybridization techniques in the examination of sacroiliac joint biopsy specimens from patients with ankylosing spondylitis. Arthritis Rheum 1995;38:499–505.
. IL-23 induces spondyloarthropathy by acting on ROR-gammat+ CD3+CD4-CD8- entheseal resident T cells. Nat Med 2012;1:1069–76.
. Clinical response to discontinuation of anti-TNF therapy in patients with ankylosing spondylitis after 3 years of continuous treatment with infliximab. Arthritis Res Ther 2005;7:R439–44.
. Repeated infusions of low-dose infliximab plus methotrexate in psoriatic arthritis: immediate benefits are not maintained after discontinuation of infliximab. Clin Exp Rheumatol 2005;23:145–51.
. Assessment of enthesitis in ankylosing spondylitis. Ann Rheum Dis 2003;62:127–32.
. Measuring clinical enthesitis in psoriatic arthritis: assessment of existing measures and development of an instrument specific to psoriatic arthritis. Arthritis Rheum 2008;59:686–91.
. Development of an assessment tool for dactylitis in patients with psoriatic arthritis. J Rheumatol 2005;32: 1745–50. Contributors All authors participated in the development of the consensus statement and the voting process and provided inputs into the statements presented. Funding This study was supported by an unrestricted grant from Abbott/AbbVie to the Medical University of Vienna. Competing interests JSS received grant support from and/or provided expert advice or speaking engagements for Abbott, Celgene, Janssen, MSD, Pfizer and UCB. JB received grant support from and/or provided expert advice to AbbVie, Celltrion, Janssen, MSD, Novartis, Pfizer, UCB. MD has participated in advisory boards and symposia organised by Pfizer, AbbVie, UCB and Roche; his department has received research grants from Pfizer, AbbVie, UCB, Roche, Lilly, MSD and Sanofi. PE has undertaken clinical trials and provided expert advice to MSD, Pfizer, Abbott and Novartis. OF received grants from AbbVie, Pfizer, BMS, Roche and MSD and served as speaker at meetings for AbbVie, Pfizer, MSD, UCB and Celgene. PH received honoraria from Abbott, Celgene, BMS, Pfizer, Merck, J&J and UCB. AK conducted clinical research sponsored by AbbVie, Amgen, UCB and Jannsen, and provided expert advice for AbbVie. TKK received honoraria for speaking and/or consulting engagements from AbbVie, AstraZeneka, BMS, Hospira, MSD/Schering-Plough, Nicox, Pfizer, Roche and UCB and Diakonhjemmet Hospital received research funds from AbbVie, BMS, MSD, Pfizer, Roche and UCB. RL has received research grants from Abbott, Amgen, Centocor, Novartis, Pfizer, Roche, UCB; speaker fees from Abbott, Amgen, BMS, Janssen, MSD, Pfizer, Roche, UCB and is director of Rheumatology Consultancy BV, a registered company under Dutch law. TL has no conflict to declare. PM has received research grants, consultation fees and/or speaker honoraria from AbbVie, Amgen, BiogenIdec, BMS, Celgene, Genentech, Glaxo SmithKline, Lilly, MSD, Novartis, Pfizer, UCB, Vertex. IO has received consulting fees, research or institutional support and educational grants from AbbVie, MSD and Pfizer. JR has consulted for AbbVie and UCB and has participated in clinical trials of AbbVie and UCB on axial SpA. CR received research support from Amgen, Janssen, UCB and has consulted for AbbVie, Amgen, Janssen, UCB, Boehringer Ingleheim, Regeneron and Lilly. MR has received honoraria from or has served as consultant for AbbVie, BMS, MSD, Pfizer, Roche/Chugai, UCB. MS has received honoraria from AbbVie. JS has received grant support from AbbVie, MSD, Pfizer, Janssen and Honoraria for consultancies and/or lecturing from AbbVie, Merck, Pfizer, Janssen, UCB, Novartis, Lilly, Sanofi, Roche. MdW received honoraria from Abbott. XB has received research grants and consultant's, advisory boards’ and/or speaker’s honoraria from AbbVie, Celgene, Janssen, Chugai, MSD, Novartis, Pfizer, UCB. NB has received consultancy fees from Roche, BMS and Pfizer. RB-V has received honoraria for speaking and/or advisory board engagements from AbbVie, BMS, Pfizer, Roche and UCB. EC-E declares no conflicts. AD has participated in advisory board activities for UCB, Pfizer, AbbVie and has received research grants from AbbVie, Amgen, Janssen, Novartis, Pfizer and UCB. DE received grant support from Merck and Abbott. LG has received honoraria from AbbVie, Chugai, Pfizer, Roche and UCB. MJ declares no conflicts. MM declares no conflicts. KR has received grant support and/or provided expert advice and/or presentations for AbbVie, BMS, Glaxo, MSD, Novartis-Sandoz, Pfizer, Roche and UCB. FvdB provided advice for Abbott. JC-CW declares no conflicts. K-W has received research grants from Pfizer and consulting fees from Pfizer, UCB, Genentech and AbbVie. DvdH has received consulting fees and/or research grants from AbbVie, Amgen, AstraZeneca, Augurex, BMS, Centocor, Chugai, Daiichi, Lilly, Glaxo-Smith-Kline, Janssen Biologics, MSD, Novartis, Novo-Nordisk, Otsuka, Pfizer, Roche, Sanofi-Aventis, UCB and Vertex, and is Director of Imaging Rheumatology bv.